Millenials Drink Nearly Half of All Wine in United States There has been a marked increased in wine consumption by millennials, who drank 42% of all wine (159.6 million cases) in 2015 as reported by the Wine Market Council (WMC). Millennials include those between the ages of 21 and 38 and now make up the largest wine-consuming demographic in the United States (36% of all United States wine drinkers). Data indicates that millennials are trading up, with the WMC survey showing that older millennials were increasingly buying a bottle of wine costing over $20. I have two sons, who are both millennials and educated professionals, and they definitely consume wine, but also craft beer and exotic cocktails. However, neither one can afford to buy premium Pinot Noir that usually is priced above $50, and I wonder how this bodes for the future premium Pinot Noir market. The Baby Boomers, those aged 51 to 69 and Generation X, those aged 39 to 50, who make up the largest group of premium Pinot Noir consumers, have fallen to 36% and 34% of all United States wine drinkers. Consumers Still Prefer Chardonnay and Merlot The second annual report on American wine consumer preferences was released in November 2015 by Sonoma State’s Wine Business Institute. The study surveyed 1,072 wine consumers ages 21 to 68 (a relatively small sample in my mind). Even though sales of Pinot Noir have increased in recent years, when subjects were asked to pick their favorite grapes from a list, 50% included Chardonnay and 49% Merlot, 41% included White Zinfandel, 40% Pinot Grigio, and 38% Cabernet Sauvignon and Pinot Noir. Consumers reported that they preferred wines that were “fruity,” “semi sweet,” and “smooth.” Only 26% preferred dry wine styles. About 5% of respondents usually spend over $25 per bottle for wine that is drank at home. Moderate Alcohol Consumption Improves Lipid Profile The International Scientific Forum on Alcohol Research critiqued a published study, “Support for a causal role of alcohol consumption in improving the lipid profile,” found in PLos One 2016. The paper was based on data from more than 10,000 Americans of European descent who participated in the Atherosclerosis Risk in Communities (ARIC) study. The Forum concluded that the study provided important data indicating that light-to-moderate alcohol consumption has favorable effects on most lipid values. The effects shown for HDL-cholesterol support much earlier data, and the effects on small dense LDL-cholesterol and ApoB provide key new information. The effects of lipids are important factors in the protective effects of moderate drinking against cardiovascular disease that have been reported in almost all well-done cohort studies. To read the full critique, go to www.bu.edu/alcohol-forum/ critique-181. Wine Prevents Dementia Says Latest Study A review and analysis of almost 100 studies on the subject found that moderate wine consumption significantly delays dementia. Dr. Jeremy Spencer led the researchers who reported in the journal Safety, Consumer Preference, and Human Health. Phenols most commonly found in red and sparkling wine can help to protect brain cells from damage and keep nerve and brain cells communicating with other cells, thus countering the process that leads to Alzheimer’s Disease. 9th Annual Pebble Beach Food & Wine Festival Presented by Food & Wine, this 4-day event, March 31-April 3, 2016, attracts revered chefs from across the globe as well as acclaimed wineries for cooking demonstrations, wine tastings, and exclusive dining experiences set against the backdrop of Pebble Beach, California. The impressive list of California and Oregon winery participants who are primarily Pinot Noir producers includes: Antica Terra, Archery Summit, Belle Glos, Brooks, Chamisol, Domaine Anderson, DuMOL, Failla, Hahn Family, Hanzell, Keller Estate, MacPhail, MacRostie, Melville, Patz & Hall, Pisoni, Samsara, Testarossa, Three Sticks and Willamette Valley Vineyards. Tickets are available at www.PBFW.com. Sonoma in the City - Houston On Tuesday, March 1, a grand tasting of over 200 wines from 16 distinctive Sonoma County regions will be featured along with an array of appetizers, artisan cheeses and charcuterie. For tickets got to www.tastesonomahouston.eventbrite.com. Enter promotional code “friends” and get a 40% discount on your ticket. 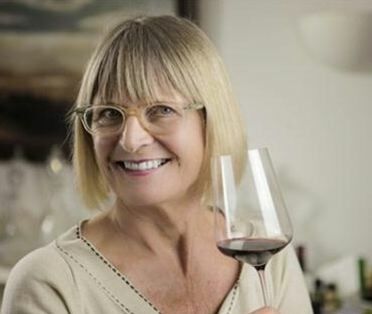 Jancis Robinson Launches Online Wine Course Renowned wine expert, Jancis Robinson, has developed a wine course which can give even complete beginners an understanding of wine in a single evening. The course includes 51 short lectures spread over 3.5 hours of video. Those that sign up for the course ($71) have lifetime access to its lectures and a 30-day money back guarantee. It is available on iOS and Android. 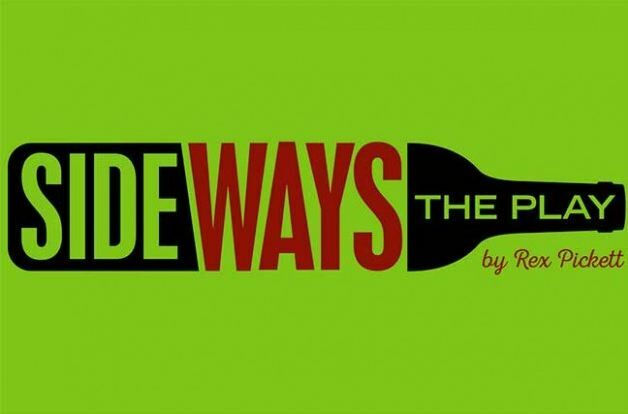 Anyone beyond the initial stages of learning about wine will find this course interesting but less beneficial. Visit www.udemy.com/mastering-wine-jancis-robinsons-shortcuts-to-success/ for more details. 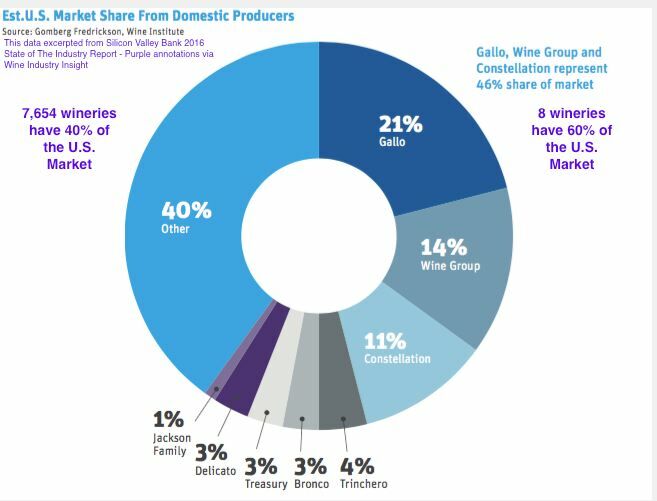 8 Wineries have 60% of U.S. Wine Market According to Gomberg Fredrickson, Wine Institute based on data excerpted from Silicon Valley Bank 2016 State of The Industry Report, Gallo (21%), Wine Group (14%), Constellation (11%), Trinchero (4%), Bronco (3%), Treasury (3%), Delicato (3%) and Jackson Family (1%) have 60% of the U.S. wine market while 7,654 other wineries have 40% of the U.S. wine market. 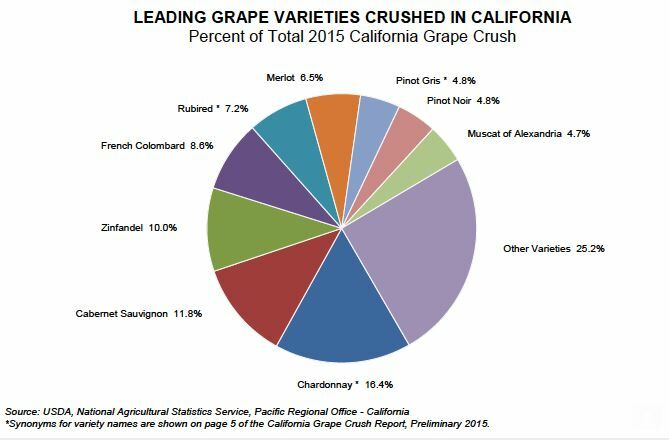 Report of Leading Grape Varieties Crushed in California in 2015 The USDA, National Agricultural Statistics Service, California Pacific Regional Office reported the percentage of each grape variety crushed out of the total 2015 California grape harvest. Thanks to Lewis Purdue of www.wineindustryinsight.com for this graph. International Wine Film Festival Debuts This 3 week event series offers the best in wine-themed video from February 14 - March 5, 2016. This innovative experience was started by Wil Fernandez (the man behind the film, Vintage 2014) and is the first event of its kind. A number of wine and film events will be held in Santa Barbara County at vineyard locations, culminating in a screening of winning films at the Bacara Resort on March 5, hosted by Fred Dame MS. The screening in the Bacara Theater is open free to all WOPN early admission Saturday Grand Tasting ticket holders. Visit www.winefilmfestival.com and www.facebook.com/ WineFilmFestival. Linfield College in Oregon Launches Wine Studies Program Linfield College, located in McMinnville in the Willamette Valley of Oregon and the long time home of the International Pinot Noir Festival held each July, will begin offering students a wine studies minor to accompany their major degree of choice. Linfield’s faculty are involved in wine research projects, the campus houses the Oregon Wine History Project and wine archives, and the private college’s president, Dr. Thomas L. Hellie, is a wine enthusiast and advocate. Petaluma Gap Wineries River Cruise Four Petaluma Gap wineries will be on board for “Cruising The Rhone River” on the AmaCello, March 23-30, 2017. The wine hosts are Ana Keller of Keller Estate, Alexandre Remy of Agnitio Wines, Evan Pontoriero of Fogline Vineyards and Rickey Trombetta Stancliff and Erica Stancliff of Trombetta Family Wines. Experience four-course winemaker dinners, hosted tastings and seminars featuring more than 20 Petaluma Gap wines as you cruise through France’s Rhone River Valley. The 7-night cruise is $2,149 per person. For information, contact Expedia CruiseShipCenters, North Bay: wineclub@cruiseshipcenters.com and 877-651-7447. Russian River Valley Single Vineyard Night Small lot, single vineyard wines from the Russian River Valley will be poured Thursday, April 7, 2016, in Sacramento, CA, at Library Galleria. Sponsored by the Russian River Winegrowers, more than 20 wineries will be present including Balletto Vineyards & Winery, Davis Family Vineyards, Dutton-Goldfield Winery, J Vineyards & Winery, MacRostie Winery & Vineyards, Matrix Winery, Siduri, Sojourn Cellars and The Calling. Tickets: www.eventbrite.com. Vinotemp Zero-G Suspended Cable Wine Racking System This is a new and modern storage solution for your wine collection that caught my eye. 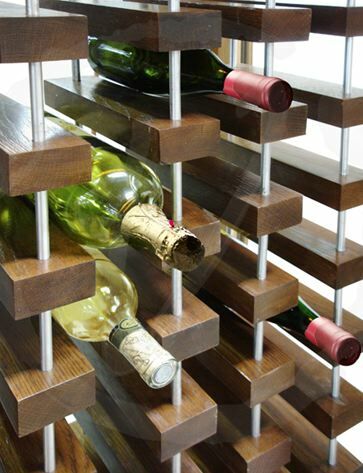 When installed in a cabinet, the racking creates the illusion that your bottles are floating due to the configuration of wood blocks and aluminum rods. Racking and finish can be customized to accommodate your largest Pinot Noir bottles. Check it out at www.vinotemp.com.